Just a quick post here. There is a new CNN story that may be of interest. An antibiotic-resistant superbug will launch from the same pad where the first manned mission to the moon lifted off to be studied on the International Space Station. We know lots of ways to accelerate mutation rates on earth – radiation, making mutations in DNA repair genes, other mutagens, and so on. Why would using microgravity be worthwhile compared to those other methods? I do not know. Also – each agent that leads to an increase in mutation rate has it’s own spectrum of types of mutations that it accelerates. Who is to say that microgravity will increase mutations in the same way that they would occur on earth with just an increase in speed? Same issues I guess. Even if microgravity led to an acceleration in the mutation rate, I just don’t see how that will help anticipate the mutations that will show up on Earth. 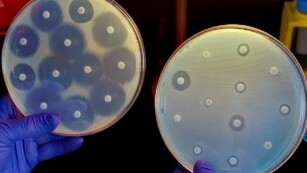 I am all for doing research on microbes in space, for many reasons (e.g., see http://spacemicrobes.org). And certainly microgravity could be an interesting tool for studying some processes in microbes. But I am skeptical of some of the claimed goals of this project. Not that I object to this work – I think we can learn a lot from such experiments – just not what is being claimed here. And to be honest – anything that gets the public to think more about microbes can potentially be a good thing, it just should be presented carefully. I assume there is much more to the science here than is being reported in the news stories. The basic science part of this sounds interesting. I am just deeply skeptical of the claimed applied value (e.g., predicting future mutations of MRSA). I completely agree. Here’s my take on similar NASA hype from a few years ago: http://rrresearch.fieldofscience.com/2011/04/do-bacteria-become-superbugs-in-space.html.